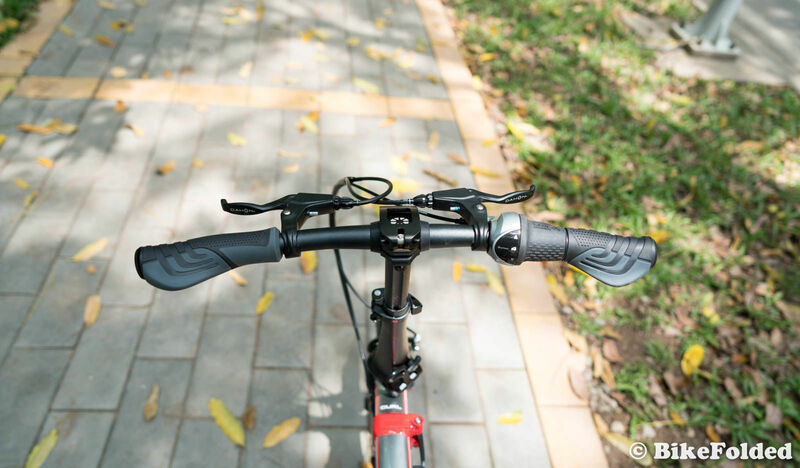 The Dahon Curl was brought to life from a Kickstarter project last year. 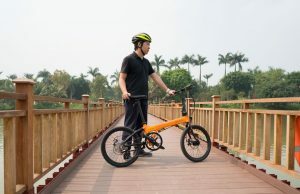 The crowdfunding campaign was not really successful but it has caught some attention because of a unique design that is totally different from the previous Dahon bikes. 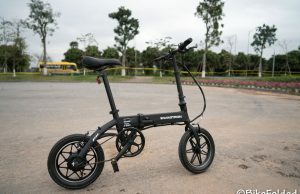 The Dahon Curl i8 was born to compete directly with Brompton bikes, let’s find out if this is really the Brompton killer that we all are waiting for. 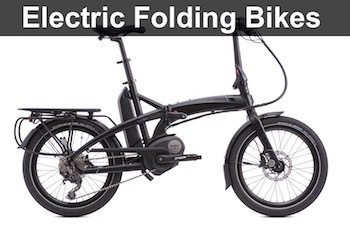 The Dahon Curl i8 has exactly the same folding mechanism as the Brompton‘s. 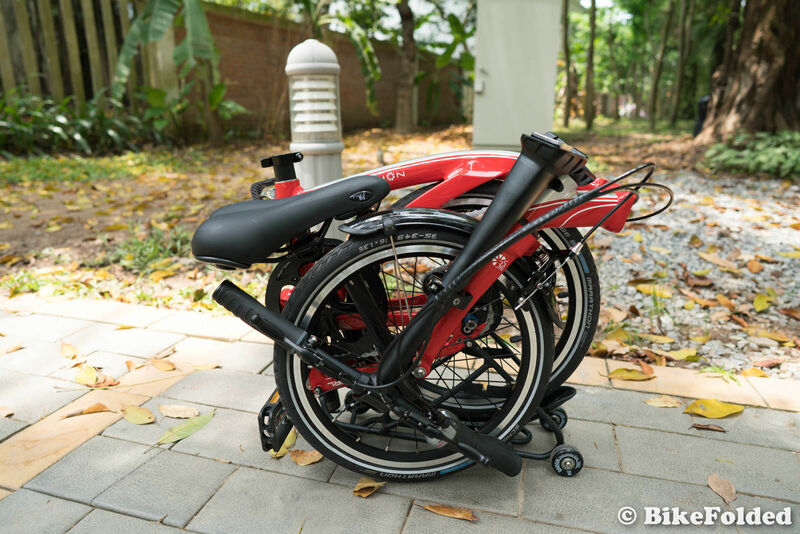 It features the rear triangle flip fold that has been made popular by Brompton bikes. It took them so long to make the bike because they have to wait until the patent expires. And finally, the Curl was launched for the 35th anniversary. 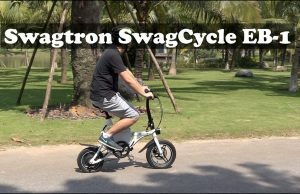 In fact, the Dahon Curl i8 is not a Brompton clone and we all can distinguish the 2 bikes. 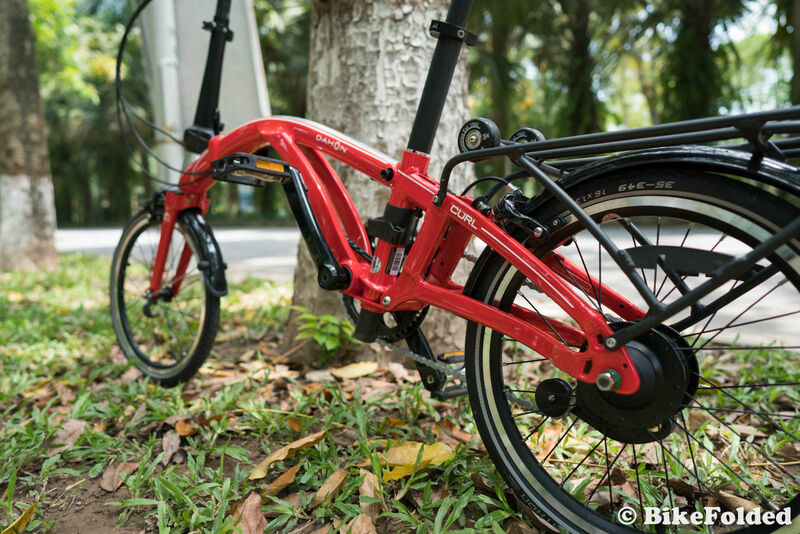 Dahon aimed to build a better version with some improvements. Are they successful? 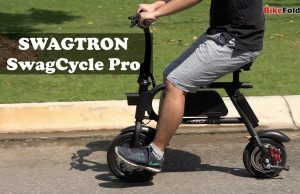 I expected a lot from the Dahon Curl after seeing the bike at Taipei Cycle, so I was quite excited when I could finally test the folding bike. My first impression with the bike was not so good. As soon as I took it out of the box, I could see the chain tensioner is broken. I was quite disappointed because that was the first time I received a Dahon with a broken part. Then I had to wait a couple of weeks for the replacement part. When I installed the new chain tensioner, I immediately figured out why it was broken in the first place. 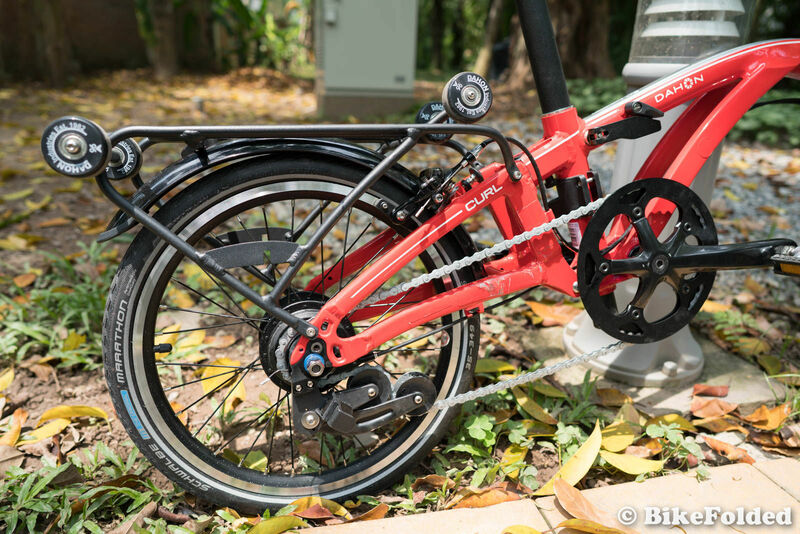 If you watch the folding demonstration, you can see that the front wheel is folded back and leans on a plastic holder on the chain tensioner. Therefore, the part can easily be broken during transportation. This is not the only fault in the folding mechanism. After you lift the bike to fold the rear wheel, you shouldn’t turn the pedals backward because the chain will fall off then. The cables are not run neatly in unfolded position. The brake and gear cables hang around in front of the Dahon, so they don’t look as tidy as the Brompton. Last but not least, one of the four wheels on the rear rack is not aligned properly. Therefore, the bicycle can’t stand on its own after I fold the rear wheel. 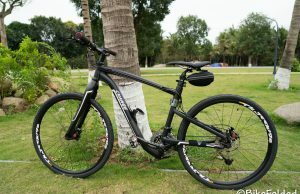 Besides, I also have some trouble when rolling the Dahon in the folded position. I guess the rear rack was bent during shipment and caused the issue. The bike is not lighter than Brompton. Specifically, it weighs over 29 lbs although the frame is made of aluminum. This is probably because the rear rack is quite heavy and the tubes are made bigger. Those are all problems with the Curl i8. Apart from them, this is still another decent folder by Dahon. If you get used to the Curl and don’t mess up the folding process, it is not a bad choice. I prefer using the latches to lock the handlepost and frame since they are much faster. Many people love the red color and the frame geometry, it looks really unique and attractive. 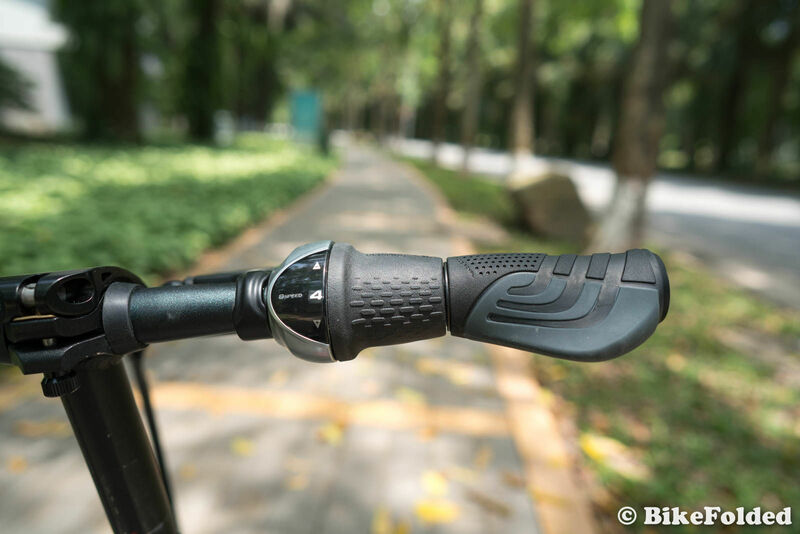 Besides, the folded size of the Curl i8 is very small, thanks to the removable saddle and quick-release pedals. I also love the internal rear hub as it looks very clean and requires less maintenance. Shifting the gears is smooth and easy, and you can see the current speed on the gear indicator next to the twist shifter. The riding comfort is fairly good although the wheels are small and there is no rear suspension block. You will still feel the impact of potholes but there is no difference when riding on paved roads. The bike is stiff and I don’t see any frame flex at all. 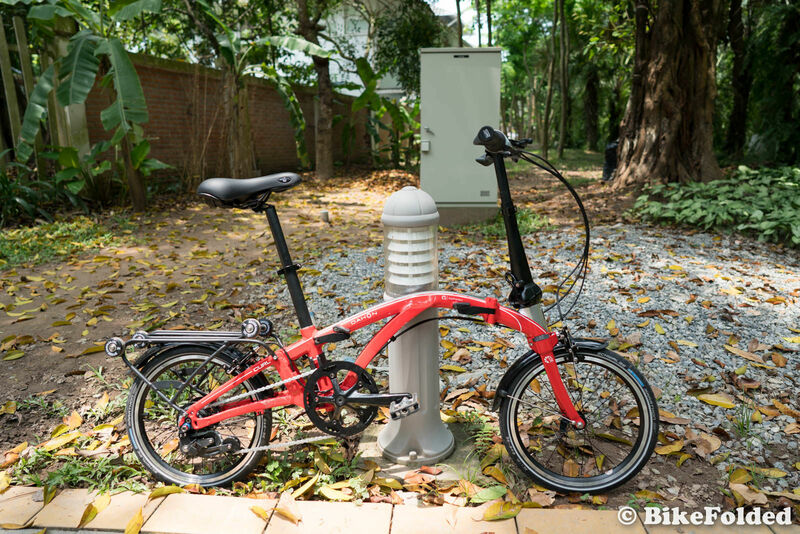 Another advantage of the Curl i8 is that Dahon manages to raise the rider’s weight limit to 286 lbs, which is about 18% higher than most folding bikes on the market. 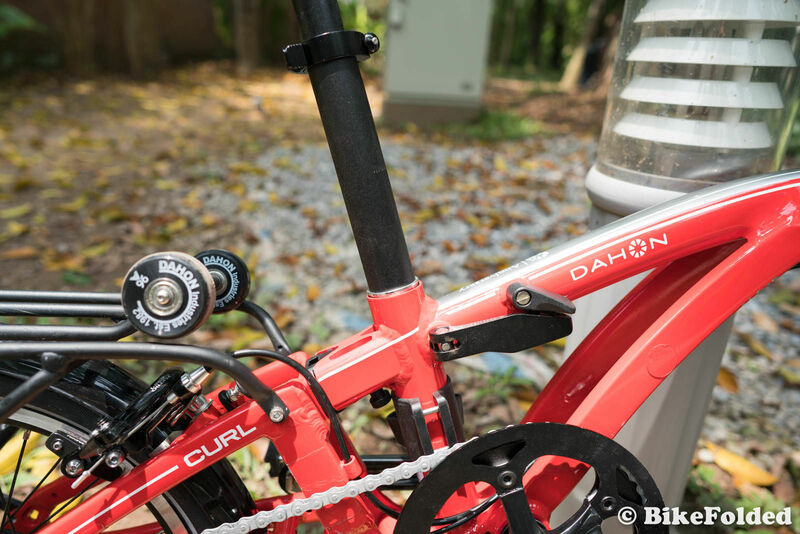 It’s very difficult to justify the premium price tag of the Dahon Curl i8. 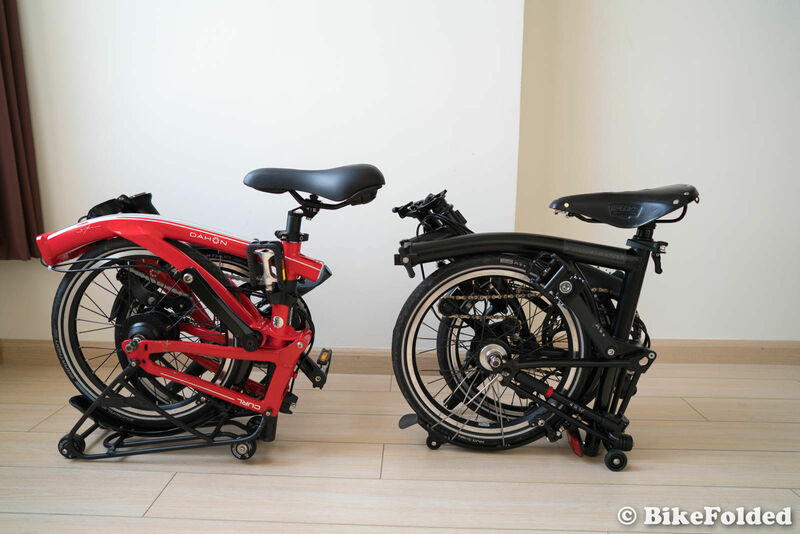 It is even more expensive than many Brompton models even though its folding mechanism is inferior to that of the competitor. The bicycle is built for die-hard Dahon fans who want to own the 35th-anniversary version, we at BikeFolded.com don’t recommend it at the moment. This is a good bike once you get used to the folding process, however, the price is unaffordable for most riders. Why isn’t it made perfect? But a tensioner that breaks and a chain that falls aren’t top, though not dramatic to be honest (they could find a solution to the tensioner during shipping and for the chain). Still the pedals are to be removed and it is heavy plus not as small. And why use alluminum if it isn’t as valid? Price I hear – but like this it isn’t going to be a success unless sold without profit to relegate Brompton in the realm of rich-mans-bike. To the date I also still prefer Brompton: reliable and simple, still the best out there (curious about the Helix though!) and expensive but not if you consider it will last a ton of years and that for some buyers it can replace another vehicle without risking it getting stolen and without road tax and insurance. And what of an ebike version? Hilly areas for all that can’t reach the destination sweaty, not-so-fit bikers: basically a ton of people would benefit from some assistance. Thanks for the great review. 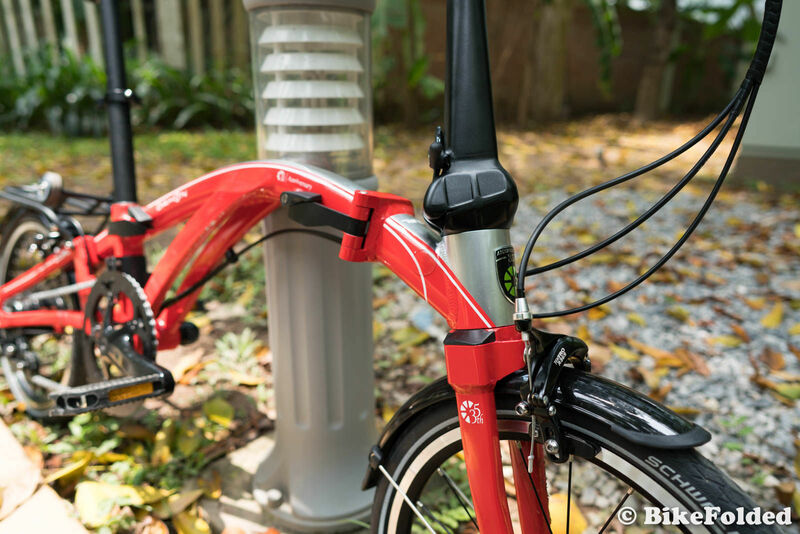 It really clears up a lot of questions and concerns that buyers might have pertaining to buying the Dahon Curl i8. 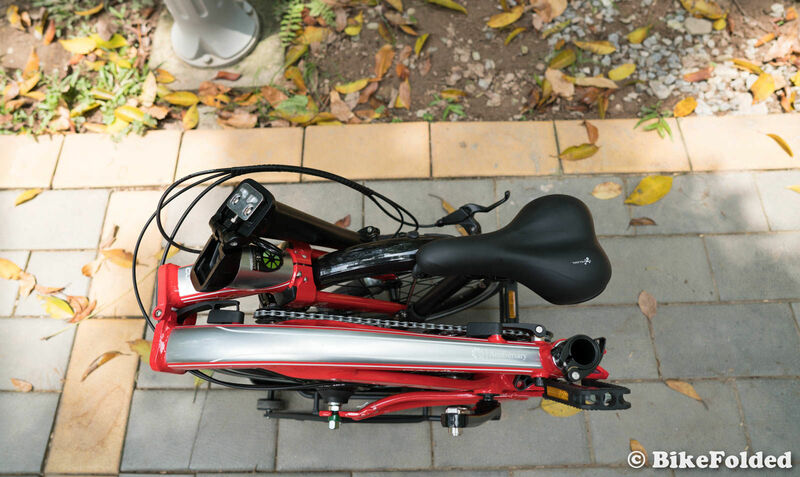 When I first heard about Dahon creating the curl to compete with Brompton, I was puzzled. 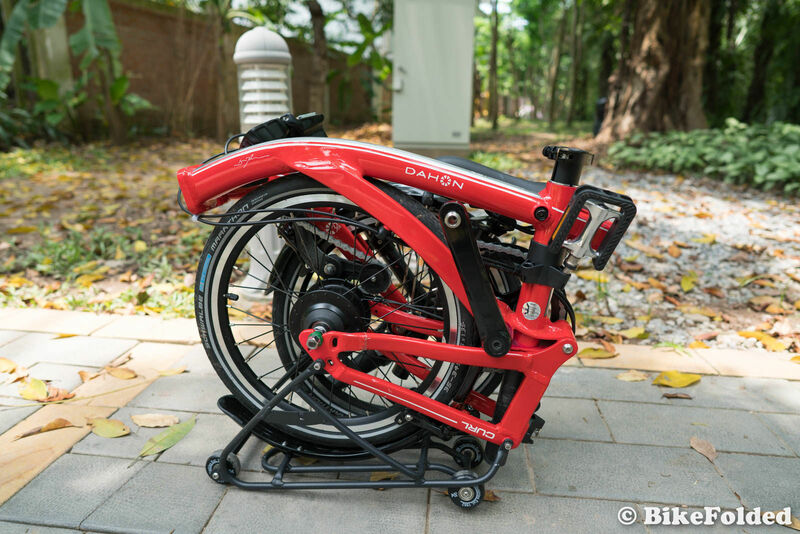 Dahon makes an exceptional 20 inch folding bike and I don’t think any other manufacturer can compete on that level. I’ve rode quite a bit of their 20 inche folders and they are completely different than a 16 inch folding bike. They have bigger wheels to provide a much smoother ride and more gears to tackle more terrain. Plus they ride faster due to the combination of bigger wheels and more gears. Twenty inch bicycles are usually cheaper because they can use more standard parts, offering you more bicycle for the money. 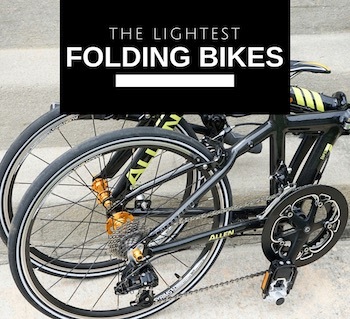 The people who buy 20 inch folding bikes understand this and are willing to compromise having the most smallest fold for the benefits I mentioned. Brompton makes a great 16 inch folding bicycle because that’s all they make. They specialize in it. Dahon can’t compete with them in this category but I don’t think they gave to. Brompton on the other hand can’t compete with Dahon in the 20 inch category because they’d get crushed. Dahon should stick to what they’re good at and that’s making 20 inch folding bicycles on up. If they stick with that and keep making improvements I don’t think anybody is going to beat them anytime in the future. Plus I’ve even considered buying a 20 inch Dahon the next time I buy a folding bike because they’re very well made and ride great. Thanks for the great review. i think the chain tensioner should be made from very strong plastic or metal. and i have one more issue with the seat post in frame part. it always move up but i solve it with super glue. I’m surprised you didn’t mention the real reason the Curl is heavier than the Brompton. It has an 8 speed internal gear hub vs Brompton’s 3 speed. That probably accounted for 3 lbs. difference at least not to mention much better pedaling characteristics. 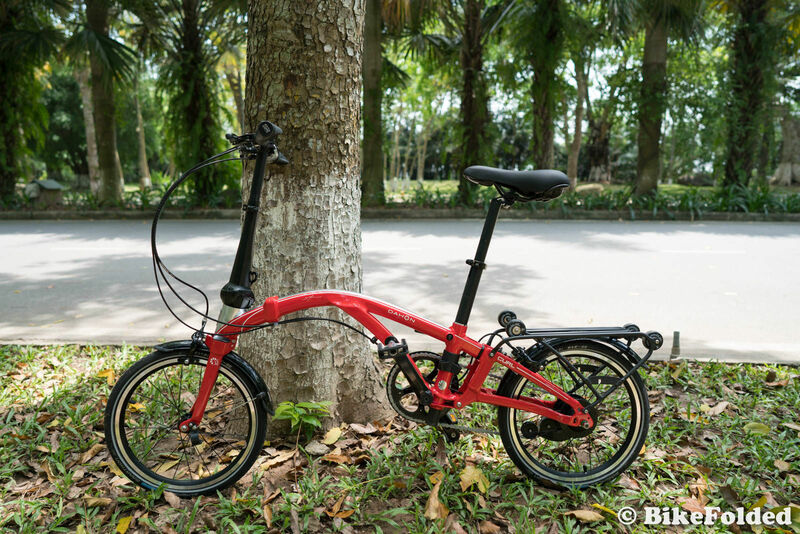 Brompton six-speed : 12kg (26lbs); The titanium version is yet about 1kg lighter… at a price.